I was absolutely thrilled with these. My FH and I love games and come from card playing families. It's my new favorite touch to our wedding. I can't wait to share! The cards are a very nice quality. A little expensive, but well worth it! The cards looked fantastic, and they were a great value. Everyone loved them, I would highly recommend them.
" 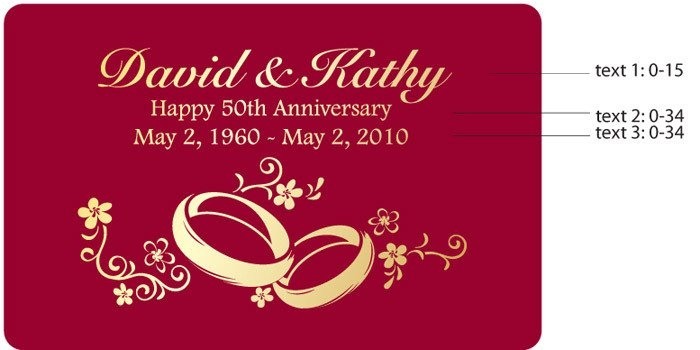 A beautiful and useful keepsake"
Everyone at our 40th wedding anniversary dinner party was so happy to see the playing cards with our name and date. The ruby red color was perfect for our table decor and added a very festive touch to each place setting. A+ These are so great! 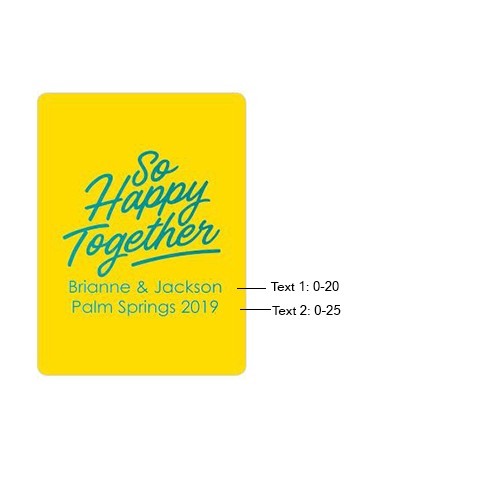 Ordered these cards to go into the Welcome Bags for our wedding guests and they arrived quickly and exactly as I expected. 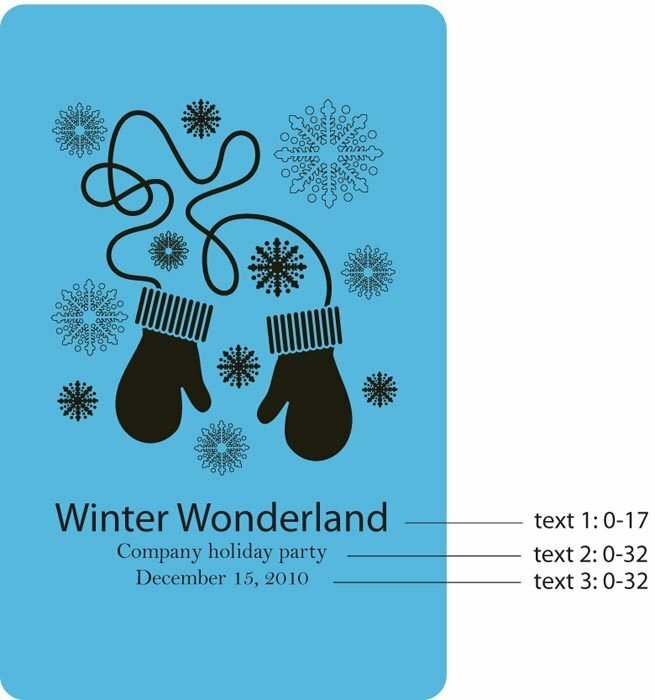 We are using this for my daughter's Alice in Wonderland Bridal Shower. They are perfect!!! 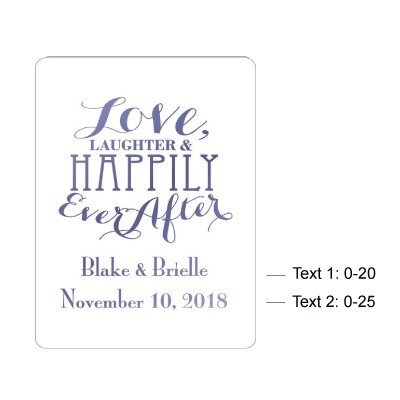 I ordered these for Our Sons wedding rehersal dinner favors along with personalized stemless wine glasses and I love them.... Such a great favor for a very special day !! Using these cards as a remembrance of my son's wedding day to everyone at the rehearsal dinner. They are really nice cards and I am so happy I ordered them. Very happy with the cards! Very happy with the cards. Great quality, colours as requested. No complaints. I was very surprised with the quality of the cards and the printing. Then I was surprised once again when they arrived as soon as they did. Great product and a great company. We ordered the Wedding Bands design on Black cards with a Foil Purple ink. The results are above what we were expecting. Very happy with our choice! My fiance and I met while playing cards so we had to have these as wedding favors. I was impressed with the quality when we got them and the customer service was GREAT! I originally ordered blue with yellow writing, and a Beaucoup service rep emailed immediately to tell me that it might not look great - the yellow would look pale. So we decided on blue writing on white and they are SHARP!. Great quality playing cards. If you're worried about not seeing them before you order, just call their customer service. I had a great experience and love the cards. Can't wait to see my guests' faces when they get them! I looked on a lot of websites to try to find the right balance of personalization vs value and this site was the best. The cards are very high quality and looked exactly like the images. The shipping was very fast. No concerns whatsoever! Thanks Beau-coup! 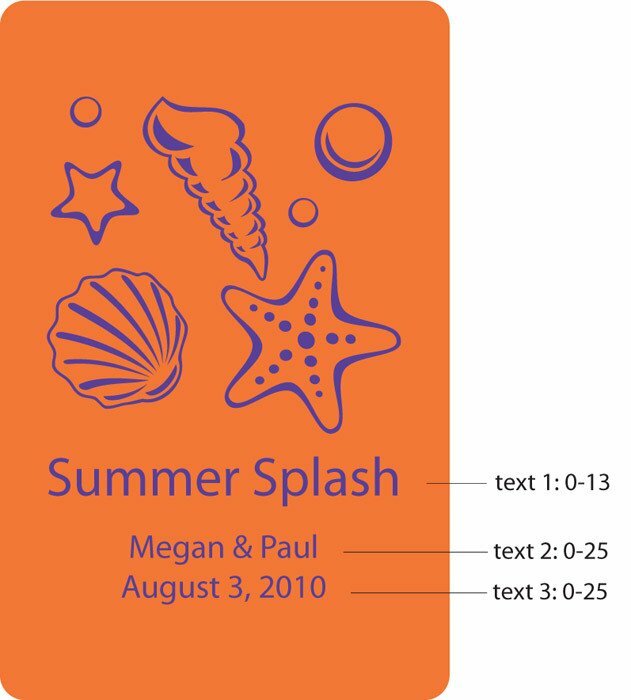 This is a great party favor just wish the lettering was a little bigger. But they are really a great favor. I'm very happy with them. 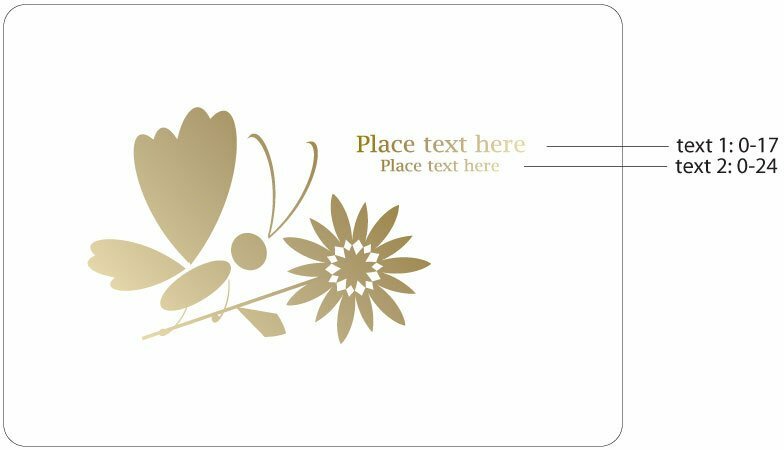 I purchased the personalized set of playing cards, custom theme:dandelion. They're beautiful but I am surprised how small their picture and wording is. Delivery to Australia is also very pricey! But they were delivered quickly. Overall still happy witurchase and hope our guests get enjoyment out of them for years to come! we purchased these as part of the bridal party gifts. I collect cards and we play often. I thought about purchasing these for about 2 months before I bought them. If I had known how wonderful they were going to be, I would have not had any doubts. Our bridal party and family loved them. I'm from Brazil. Here we can't find one product like this one... Is perfect and has a good value. The problem was that the delivery for 300 units was more than u$1000 so, i went to US to my bachelor party and sought my request. Bought these to give in teh wedding party giftbags and the hotel guests welcome bags. They are good quality and the persoalization turned out perfect. Quick delivery too, even to Canada. This is great as a party favor. The quality of the cards is very good. You can't go wrong with these playing cards for the guys as a party favor. I am excited to put these cards in all of my wedding welcome bags. However, I would say the only con is it is difficult to envisions how it looks in the end when your picking all of the elements (color,desight, personalization). I wish mine looked a little nicer. Fit my theme thank you for collegues. 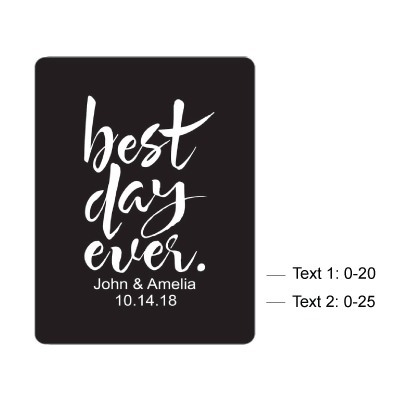 I am about 2 weeks away from our destination wedding and thought these personalized playing cards would be a perfect item for our welcome bags. I received my order and I couldn't be happier. The cards are a great quality and the printing looks fabulous. I am very very happy with them! Catch their eye with a twist!!! I used the playing cards as my save-the-date and I recieved calls from friends and family about how unique an idea it was to recieve such a nice save-the-date. I expressed that I wanted a save-the-date people could use and wouldn't toss in the trash. The response was they were too cute to use they just wanted to keep them because they were so unique and stylish. 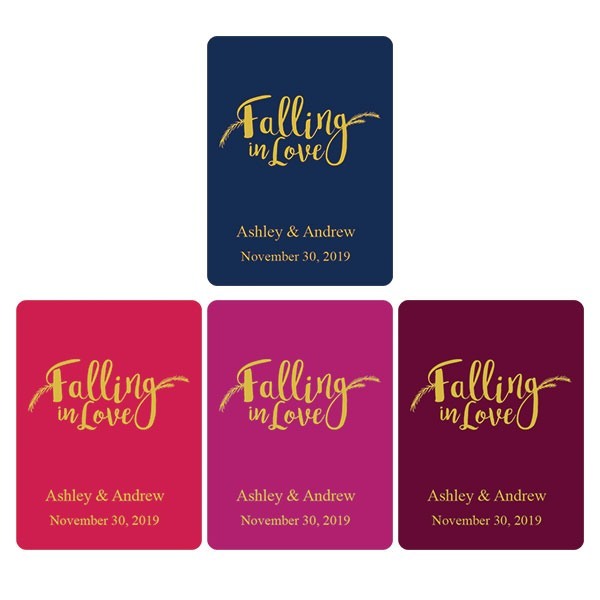 I had the cards printed in our wedding colors and they came out absolutely perfect. My second time buying this product! This is my second order of these personalized decks of cards. My wedding is halloween themed and so are the cards I selected...couldn't be better...my guests are going to LOVE getting these surprises at their table! My family gets together several times a year and one of our traditions is to play cards all night long. 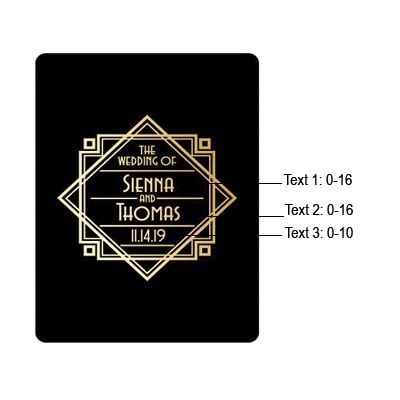 I thought that would be a fun and unusual activity to bring into my wedding reception so I ordered 25 sets of these cards with the plastic cases (extra charge). I was nervous that you don't get a preview of your design but they came out looking really great. 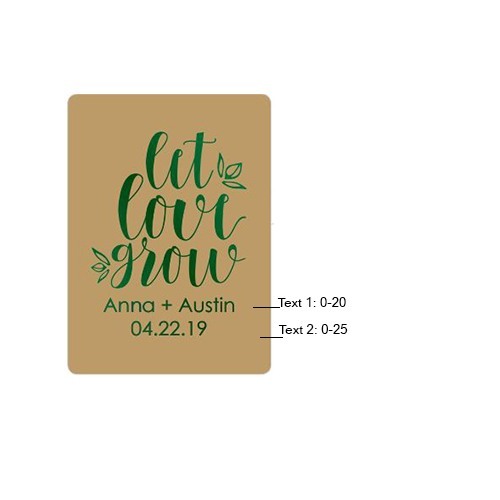 I got the silver background with metallic green print and the wedding band design. 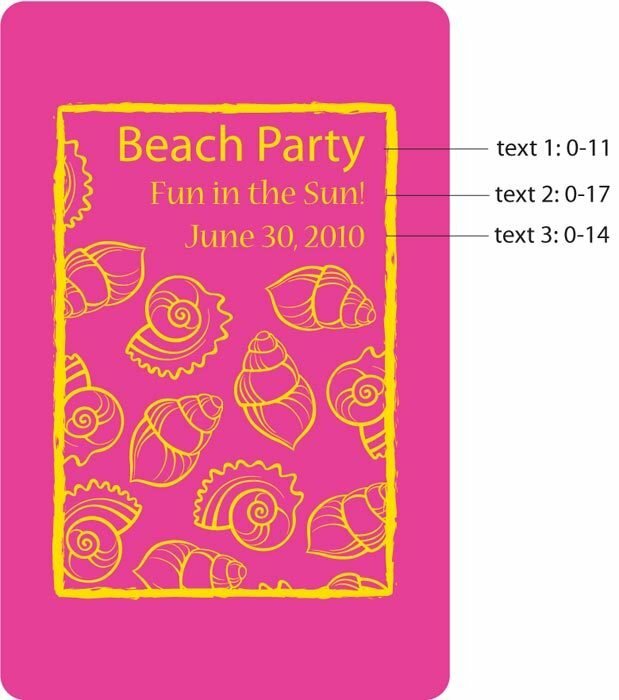 I was afraid the background would be boring gray but it has a pretty sheen to it and goes well with the metallic print. The cards themselves are not the nice linen paper of high quality poker cards but do not feel too flimsy or cheap. Since these will also be wedding favors I am glad I got the nicer cases. If you're just using them for a party or for fun the paper cases should be sufficient. Overall I am very happy with them and hope they're a hit! This was the perfect party favor for my daughters sweet 16. It is definately something to remember here by and can be carried anywhere. We purchased these for favours for our September wedding. I shopped around but decided on these because: [...] EVERY card was personalized, large assortment of colours and styles. Only thing we regret is not purchasing the plastic cases. All in all, very happy with this product. I used these as a party favor for my husbands 40th birthday bash. Everyone loved the cards and thought they were unique and useful. What a great reminder they will have. I did these as my wedding favours. they were so great. the quality is superb! looks great in the clear plastic box. Just received my personalized cards today and I LOVE them! I was a little iffy at first because I didn't get to see what the colors would look like together but all I can say is WOW, glad I went with my gutt. 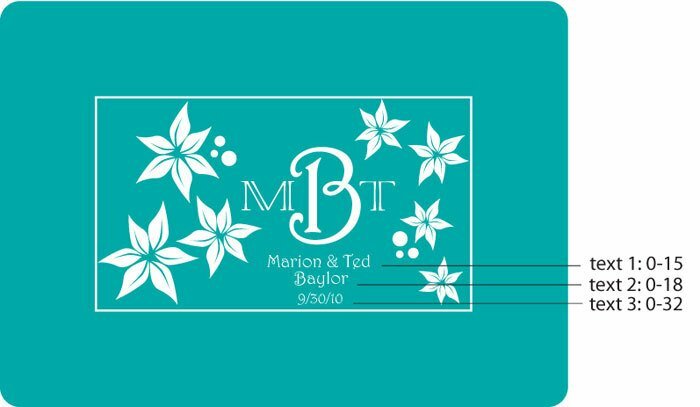 We got the turquoise card and bronze lettering. These cards are part of favors that will be given away at my Dad's surprise 60th. This is something that won't be put in a cabinet to collect dust. Every card in the deck is personalized. Great quality! Thank you so much. 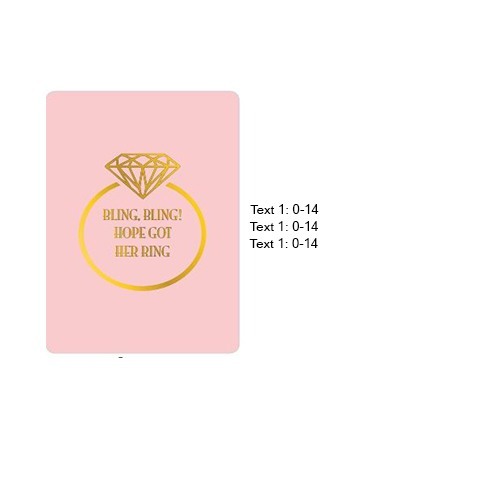 We plan to give out these decks of cards at our wedding reception in Las Vegas. 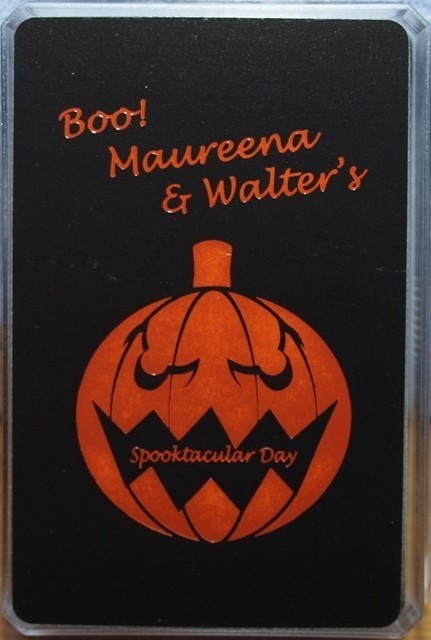 I was impressed with the quality and the printing of the cards and think our guests will love the theme. The only thing I was disappointed in: The cards do not arrive in a pretty silver box with a clear top as presented. [...] You can still see the printing on the cards, but the presentation is not as good as I was expecting. I got handed a FULL DECK! The personalized playing cards will be 1 of 2 party favors along with their golf wine stopper for my husbands 65th birthday. They [...] were of professional quality. They will be a HUGE hit. 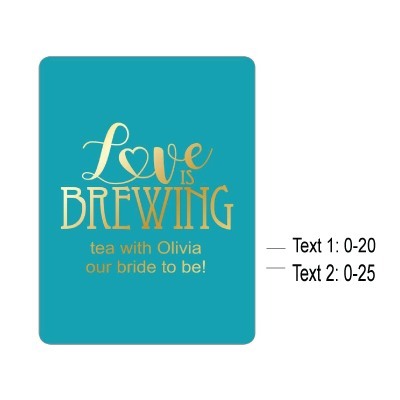 The cards were great as a bridal shower party favor. My daughter and her new husband play cards a lot so they though they were terrific and kept 5 sets. And if I make my daughter happy, it's all good. I thought though, that the printing was small and the color was darker than I imagined it to be. But I'm glad I ordered them. 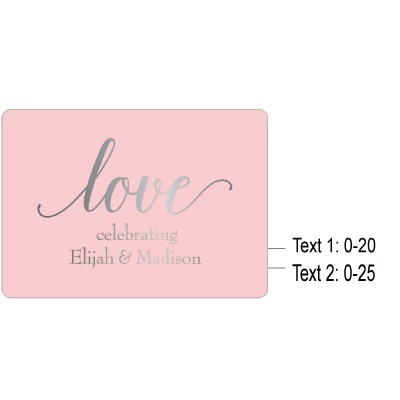 We are thrilled about the high quality, lovely printed playing cards we ordered for wedding favors. 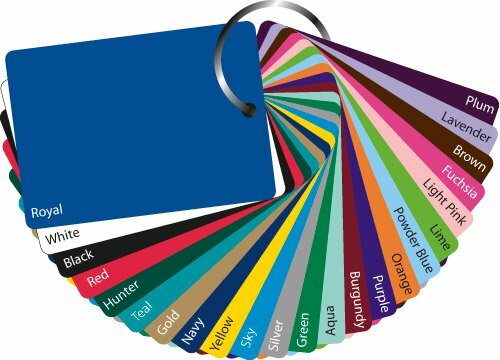 The color selection is wide, and the customization choices seem endless. The cards are wonderful...very nice quality, nice to the touch and look great! These are amazing quality, and well worth the price. 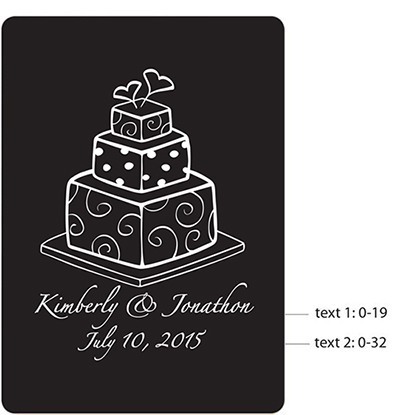 We purchased for wedding favours, and were pleased with how great they are! 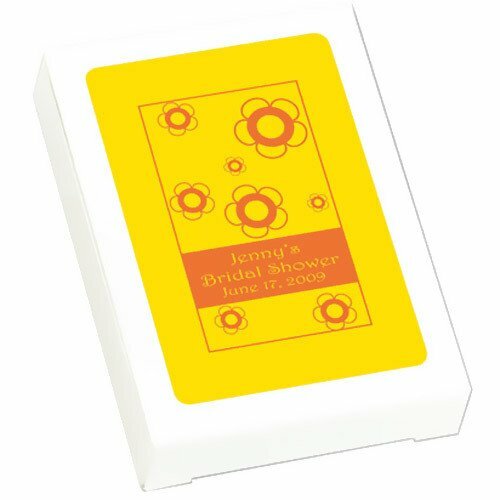 I used this product for a destination wedding favor to go in our guest welcome bags. Our guests had some cards to use at the beach in their rooms and remember us also! Quality item! I got these as favors for my husbands upcoming 50th birthday party. He and most of his friends are poker players so it was a perfect item. the printing on them was very nice and most important, every card in the decks was printed not just the case like some of the other deck choices. 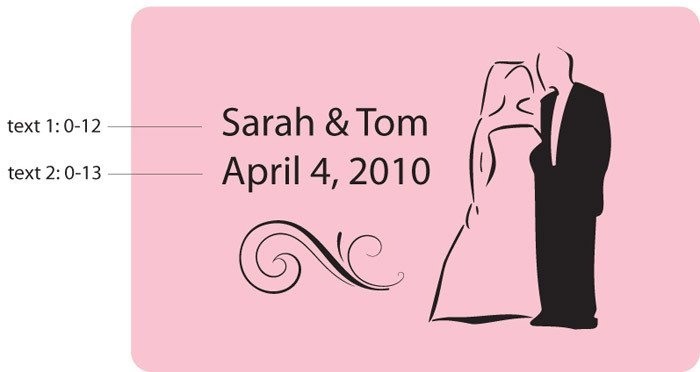 We used these personalized playing cards as wedding favors. They look really good but you cannot preview the item before you purchase it which makes it hard to see what you are exactly getting. The cards were a huge hit! 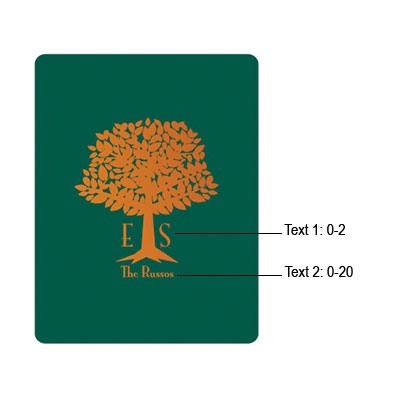 Q:Is the card stock 300 gsm? A:These are casino grade playing cards at 300 gsm. 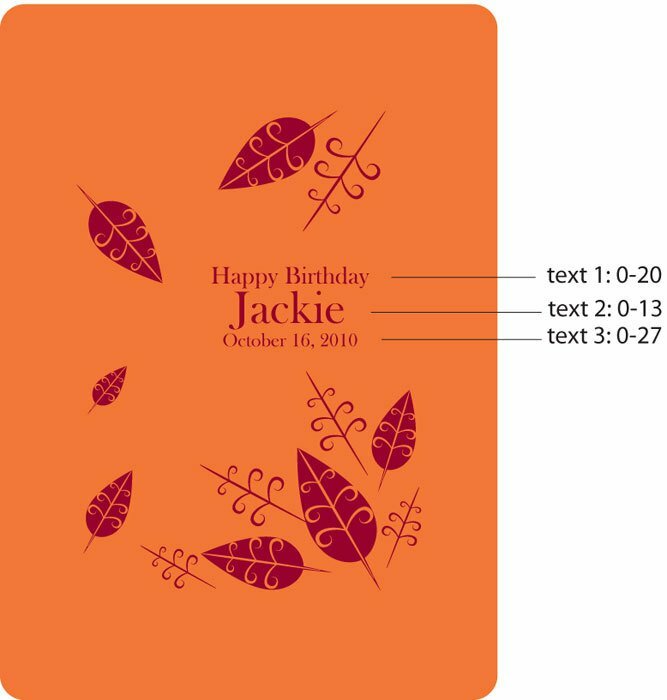 Q:Can i i see the personalized card as sample first and can i order just 5 sets and not 25? A:We have some samples pictured on our site, we are unable to place any orders for less than the minimum order of 25 sets. Q:Good afternoon, I would like to order the playing cards for a family reunion. I would like to add a photograph as m design element. 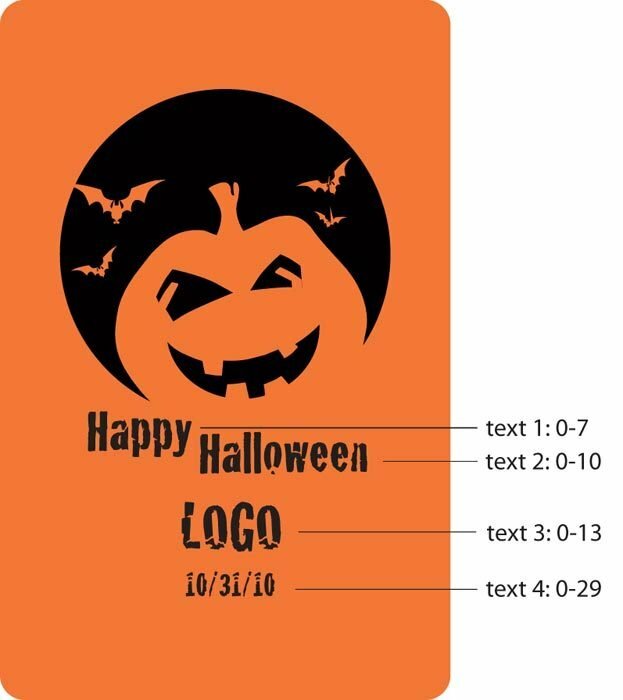 Can this be done and how can I upload the image? Can you walk me through the process? 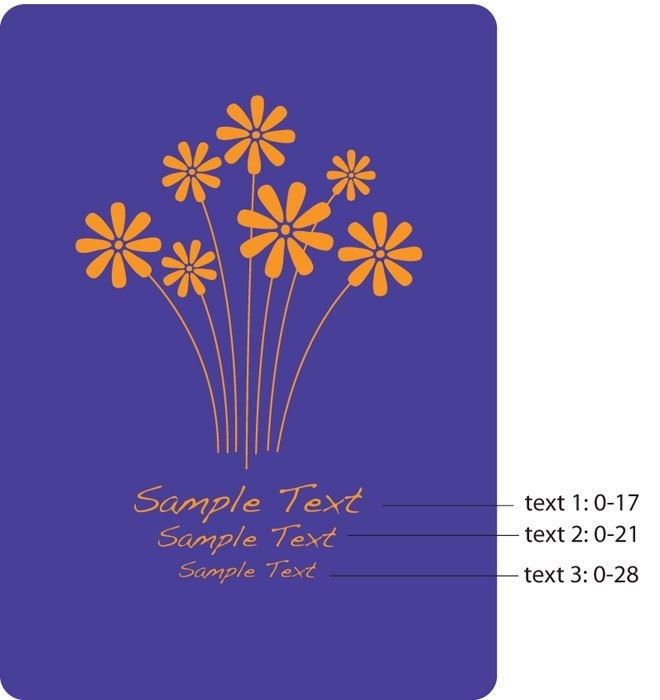 A:Unfortunately we're unable to do custom designs for this item, we only offer the designs as shown. 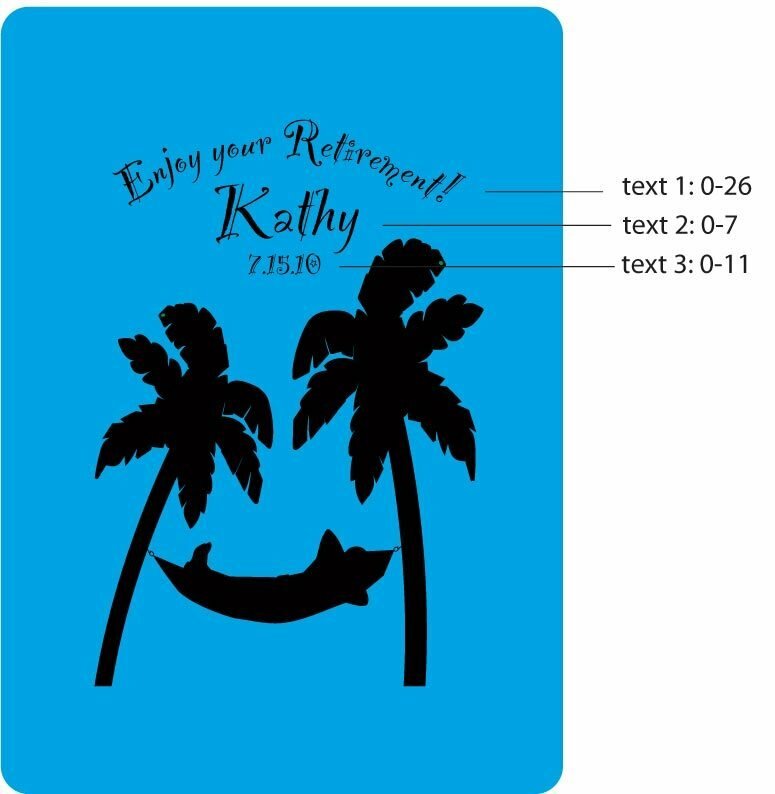 I love the quality of your cards and wondered if we could send a personalized logo instead of the ones you have preset? Q:Are these plastic coated on card stock? Q:The cards are plastic or cardboard? A:This item is made from heavyweight cardstock. Q:Can I see a preview of my order before I order 75 decks? 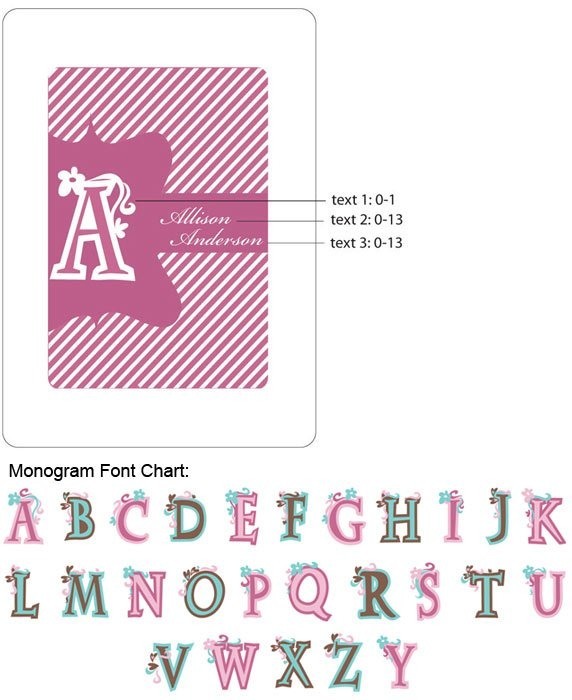 A:A proof is available for $10 per color proof or $8.00 for black and white. 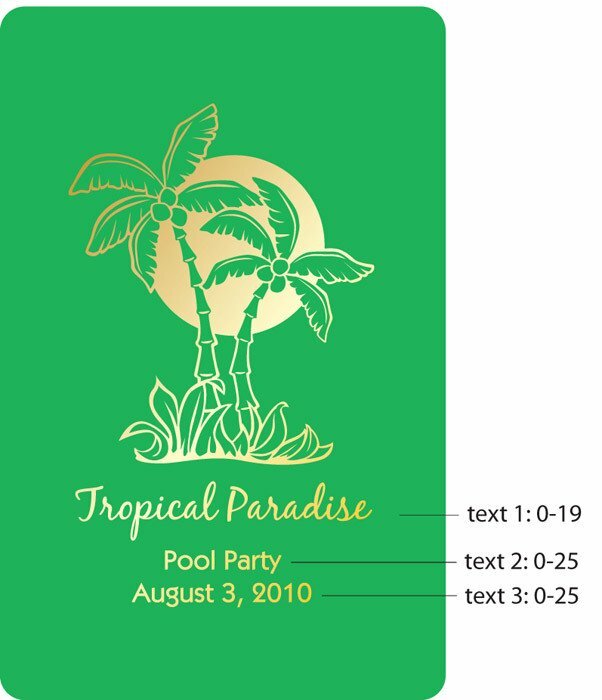 Proofs take 3-4 business days and will add to the processing time of the item. Get your poker face ready: When you see these customized playing cards in person, you'll want to smile from ear to ear! 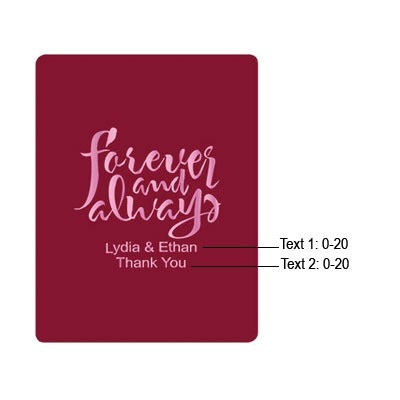 These personalized cards are fit for all occasions including weddings, bridal showers, engagement parties, and anniversary celebrations. Plus, each design is a Beau-coup exclusive. 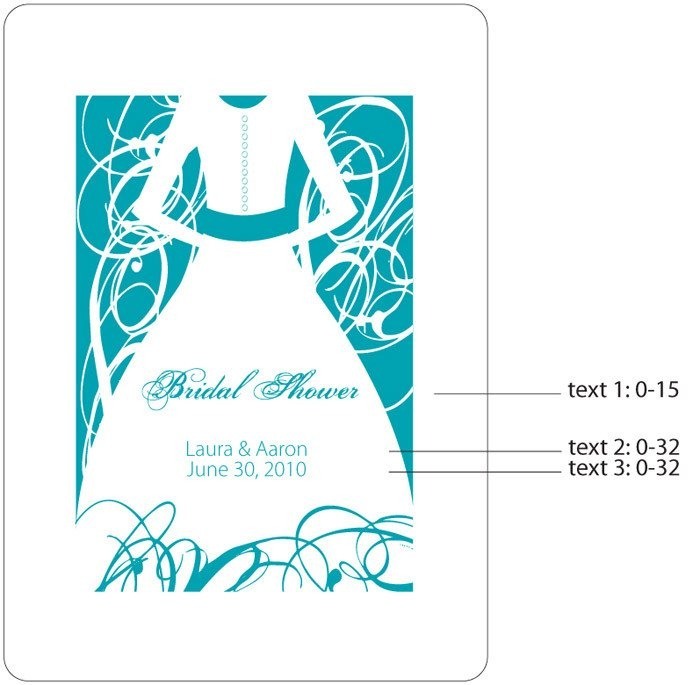 Simply choose your favorite design, card color and print color then submit your personalized text. Decks include 52 cards (and jokers) printed with your custom design. Each deck comes standard in a white tuck box with a clear window, or choose our clear plastic box for an additional fee. Keep the card theme going with custom-printed poker chips, mini gumball slot machines and poker-themed custom cookies.